When you leave a comment on THIS post by 6 p.m. CT Wednesday, November 24, 2013 you'll be entered in the DRAWING for a copy of the book I review below. If you mention in your comment that you’re a follower (see in the left column “Join This Site” and “Follow by Email”), I’ll add your name a second time in the drawing. You must be eighteen, have a U.S. mailing address, void where prohibited. You can read details about my book giveaways at Disclaimers. Author of nearly 30 novels and novellas, Carol Cox has an abiding love for history and romance, especially when it’s set in her native Southwest. As a third-generation Arizonan, she takes a keen interest in the Old West and hopes to make it live again in the hearts of her readers. A pastor’s wife, Carol lives with her husband and daughter in northern Arizona, where the deer and the antelope really do play—within view of the family’s front porch. Fired from her most recent governess position, Melanie Ross must embrace her last resort: The Arizona mercantile she inherited from her cousin. But Caleb Nelson is positive he inherited the mercantile, and he’s not about to let an obstinate woman with newfangled ideas ruin all he’s worked for. In hope of turning her interest elsewhere, he determines to get Melanie married off, and luckily, there are many single men in town quite willing to take her off his hands. The problem is, Caleb soon realizes he doesn’t want her to marry any of them. He’s drawn to her more every day, and he has to admit some of her ideas for the store offer unexpectedly positive results. But someone doesn’t want the mercantile to succeed, and threatening words have escalated into destruction and danger. Will Melanie and Caleb’s business—and budding romance—survive the trouble that’s about to come their way? Fired from her job as governess in Ohio when the parents side with the spoiled child and against Melanie Ross, Melanie has only one choice. She goes to Arizona to the mercantile store she believes she inherited from her cousin. Carol Cox fills this story with two obstinate people, a murder mystery, threatening notes for Melanie to leave town, and romance between two most unlikely people. Cox gives the reader strong characterizations, vivid settings, and the historical setting of Arizona in 1885. An enjoyable read. 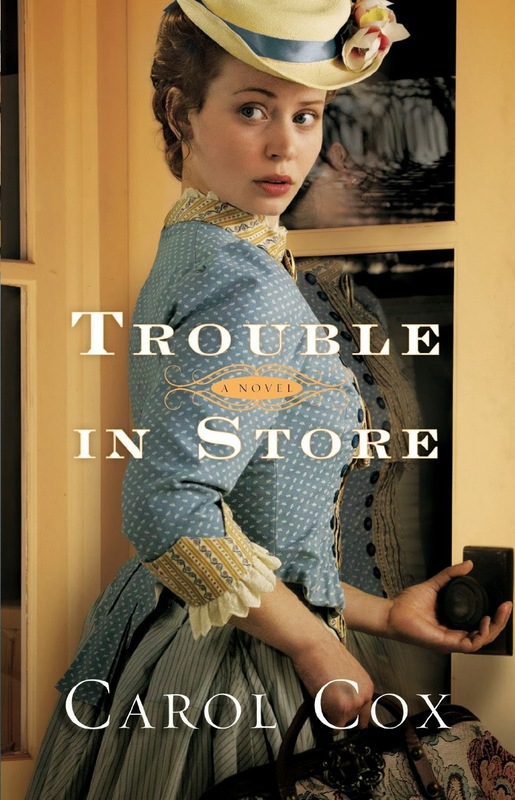 Remember: leave a comment on THIS post by 6 p.m. CT Sunday, Sunday November 24, 2013 and you'll be entered in the drawing for a copy of Trouble in Store by Carol Cox. Please, please remember to leave your email address. I’ll need your email address so that should you be the winner I can get in touch with you. I’ll announce the winner in Monday’s blog. Pat, it is entertaining--I enjoyed reading Trouble in Store. Thanks for leaving your comment. From the review, the book sounds delightful. I would love to read more! Melanie, I enjoyed Trouble in Store and you would probably also. Thanks for leaving your comment. Kathleen, thanks for bringing my attention to the error in date. Send along your email and you'll be entered in the book drawing. Great review! I can't wait to read this one so thanks for the giveaway! Abbi, glad you enjoyed the review. I appreciate your following my blog! Thanks for leaving your comment. Sounds like a fun read, I love a good historical! Patty, it was a fun read for me. I appreciate you following by email. Thanks for leaving your comment. Emily, great observation on the girl's expression on the cover. You're entered and thanks for leaving your comment. I love Carol's stories and it was her cover that drew me to the book first! Melody, the cover is attention-getting. I see below you are and follow and I appreciate that! Thanks for leaving your comment. I'm subscribed to Jo's email! Enjoyed your review. This book sounds awesome. A great read. I'm not sure if I have ever read a ny books by this author, but I love the reviews on this book. Would love to win and read this book. Thank you for the chance to win this giveaway and please enter my name. Barbara, you're welcome and you're entered in the drawing. Glad you enjoyed the review of Trouble in Store. Thanks for leaving your comment. Barbara, thanks for adding that you follow my blog. I appreciate you doing that!! I read Carol's book, Love in Disguise, and liked it very much. Trouble in Store looks like it is equally as good. Thanks for the chance to win a copy. Pam, you're welcome for the change to win a copy of Trouble in Store. Thanks for stopping by and leaving your comment. We have Carol's books in the church library. I would love to win this one to add to our collection. Janet, Carol would be happy to know you have her books in your church library. Thanks for reading and leaving your comment. Maxie, glad you liked the review. Thanks for coming by and leaving your comment. I appreciate you following my blog.